Apart from Gerry MacAvoy, Lou Martin seems to be the most famous and most popular musician who has ever played in Rory's band as you can gather from the more or less frequent polls in DEUCE; the letters that I get, as well as what the not-so-great-fans say about Rory's music. Besides, Lou is the only one - what great news- who, after their split -up, joined the band once more to record an album (see Defender). On the 20th of May, 1988, the Mick Clarke Band played Chur; it was also their first live performance with Lou Martin. It is true that Lou and Mick both played with the Killing Floor, the Ramrod and on the first two solo albums by Clarke. But they had never played live because they were just about to change the man on the keyboards. In October 1988, the Mick Clarke band played a rather long Swiss and Austrian tour, which I have organized for them. On this tour, Lou Martin played as support, his only equipment was the piano and his vocals. While being in Chur for four days with the band, Lou Martin talked about lots and lots of things. Lou was apparently enjoying the tour very much, probably because it was his first solo tour and therefore a special event. Unfortunately, we did not record any of the conversations we had during these days. Therefore I sent a written interview to Lou shortly after the concert, which he gave me back on my visit in London at the end of July 1988. In my opinion, it is a most interesting interview a of a man who lives mainly for the music (he is also fond of flowers, dogs and cats). He has seen a lot in his life, he has got a quick eye for any kind of music, and it is always interesting to listen to what he tells you. It seems that giving interviews is an everyday routine for Lou, but you will see that he is not used to it at all. So now let's hear what he has to say. Here is his very first interview for DEUCE; there is just one more interview with the NEW MUSICAL EXPRESS - what an honour for DEUCE. MG- Lou, let's start from the beginning. Where and when were you born? LM- In Belfast, Northern Ireland on the 12th of August, 1949. MG- As far as the music is concerned, were you influenced by your parents? Did you play any music at home? LM- Yes, a lot. My father sang mainly operatic music, and my mother played the piano. We listened to the music all day, mainly classical music. MG- When did you start to play the piano? MG- Who were the first people you played with? LM- The first time I formed a band was at school. It was just for fun. Nothing serious. We played rock'n'roll, Shadows songs, rhythm & blues by Muddy Waters, Chuck Berry, a few songs by the Animals, and almost everything which was in at that time. MG- Did you do any kind of job before you started to be a professional? LM- I intended to train for something, namely music teacher. But I think I was too infatuated with my own music. MG- How many years have you worked as professional? MG- When did you join Killing Floor? LM- In April or May 1968. I saw their advertisement in MELODY MAKER and answered it. MG- How come you didn't play on the second Killing Floor album, Out of Uranus, but you name is mentioned on the cover just the same? LM- At that time, I was not permanently in the band, so I played on only one song namely called Call for the Politicians. The producer wanted the keyboard sound far in the background; but he still wanted me to play somewhere. MG- Who are your musical favourites? LM- I am interested in many styles. I often listen to classical music, Beethoven, Brahms, Rachromicoff, often jazz, folk, Bob Dylan is one of my favourites, early rock, and of course, the blues. MG- Who are your favourites on piano? LM- Jerry Lee Lewis, Memphis Slim, Otis Spann, Fats Domino, Little Richard, Pete Johnson, Fats Waller, Dave Brubeck, Horace Silver, Ray Charles, Ramsey Lewis James etc. MG- Do you write some of your songs? LM- No, I just improvise known melodies and mix them somehow. MG- Would you like to record an album? LM- Sure, an album with a healthy mixture of my favourite styles and good musicians would be nice. MG- Can you give me a list of your favourite LP's? LM- Oh, I could give you 200 titles. I will try it anyway, but I just cannot give you a sequence. There are Elvis Presley ( Vol.1 & 2, The Early Years), Carl Perkins, Little Richard (number 1 and 2), Jerry Lee Lewis (practically everything), Howlin' Wolf (everything), Muddy Waters (everything), Bob Dylan (almost everything), Rolling Stones (almost everything), Chieftains (no.5), Dubliners (Revolution-album), John Fogerty (Rockin' All over the World), John Mayall, etc. MG- Now let's talk about Rory. When did you first see him live? LM- I saw him for the first time in 1968 at the Marquee Club in London, at that time with the first Taste setup, namely Eric Kitteringham and Norman Damery. MG- When did you first meet him in person? LM- It was sometime in 1971. MG- How did you come to join Rory's band? LM- Rod De'ath, who was with the Killing Floor, just like me, substituted for Wilgar Campbell on the drums as everybody knows. Shortly afterwards, Rory asked me whether I would like to join them too. MG- On the first album, Blueprint, you seem to play also on the guitar. On which songs? LM- Only on one track, on Race the Breeze. I played the rhythm guitar. By the way, even nowadays, when I am at home, I play the guitar, even more often than I play the piano. Just to relax. MG- Did you or other musicians in Rory's band never give any interviews? LM- We gave one in 1973 for New Musical Express. Gerry, Rod De'Ath and myself were interviewed. It would certainly have been great fun. But that guy was such an idiot. When the interview was published, everything had been misinterpreted. That cured us all. This one here is the second interview in my life, but this time I am convinced that you will publish what I have said. MG- Otherwise, which were the best moments during the period in Rory's band? LM- Over the years, there had been so many marvelous live shows. It is impossible for me to pick out particular concerts because most concerts with Rory were marvelous. The very best memories are those of the gigs at the Shrine Auditorium in Los Angeles in 1976 or '77 - even Bob Dylan got so enthusiastic over this shows that he came to see Rory in the dressing room after the concert- and all the shows we did during '72 and '76 in Belfast and Cork in Ireland. MG- Are there any bad memories of the Rory era? LM- If my memory does not fail me, there are hardly any bad memories. Except for some occasional trouble with the instruments there were not any. We were much more constant than other bands and this goes for Rory even nowadays. MG- Which LP, do you think, is Rory's best one, choosing from those on which you played? Which one, in your opinion, is his best of those you did not take part in? LM- Of course I have my favourites -20:20 Vision on Tattoo is really nice. At the Bottom on Against the Grain has always been one of my favourites, then Banker's Blues on Blueprint; I have still a great respect for the album, Calling Card. On this album, the band sounds incredibly compact. It has got a marvelous sound, fantastic songs. In my opinion, everything is perfect. Besides, I am happy with the version of Seven Days from the Defender album. Anyway, Defender is one of his very best LP's. MG: How did the surprising cooperation for the Defender LP come about? LM: Rory rang me up and told me that he was going to record an acoustic blues track for his new album. He thought that my style would be good for the song. It took us one afternoon to get the track finished. MG: In which country is Rory most popular? LM: I am not able to tell you because I really don't know. But I think his prestige throughout the world guarantees his success in every country. MG: Did you change your attitude towards the Rory Gallagher Band before you became a permanent member and since you left the band? LM: I always admired the band and I still do so now. Rory's set-ups have always been great; he has always had excellent musicians with him. MG: Before recording Defender, did Rory ever ask you to play on one of his other albums? MG: How was the situation when the split between Rod de'Ath and you happened? MG: Are you still in touch with each other? LM: We meet each other occasionally, but our engagements make it sometimes difficult. The contact is still there, though. I think we are always glad to meet now and then. MG: Have you ever had any contacts with other musicians of the Taste/Rory? LM: I met most of them and had a good drink with them. I have never met Norman Damery, Eric Kittering ham and John Wilson. MG: After the split, have you seen Rory live again? LM: I am quite ashamed to admit that I never have. Just once I watched a TV show with Ted McKenna on the drums. But I do want to see Rory again, particularly when he plays Mark Feltham. MG: Did you get any "precious metals' for Rory's albums on which you played? LM: For Tattoo there was a gold disc, a silver disc each for Against the Grain and Irish Tour '74. I hang them all in the front room if my house. MG: Are Rory's Irish tours so fantastic as it is described everywhere? LM: Absolutely. Ireland is our home country. The enthusiasm and gratitude which we received on our Irish tours is indescribable. It is the most thankful audience in the world. Emotional and excellent concerts. I am sure that this is still the case nowadays when the band plays there. MG: What do you think of the albums which Rory recorded with black artists such as Albert King and Muddy Waters? LM: Excellent albums. These people are our roots. MG: What did you do after the split with Rory? LM: Rod De'Ath and I formed Ramrod. Then I tried to get solo engagements. Band wise, I did not do anything except a few sessions with Dowliner Sect and Screamin' Lord Sutch. A few things with Mick Clarke. The Southside Blues band, sessions with Tommy Morrison, tours and concerts with Chuck Berry and Albert Collins. MG: What are you doing at the moment? LM: I have a flower shop on my own, which I run during the day. In the evenings, I have a permanent job with a West-end French restaurant where I am the bar pianist. It is near Leicester Square, Central London. Sessions happen occasionally. MG: How did the co-operation with Chuck Berry come about? LM: The London Capitol Radio announced that they were looking for two musicians for a Chuck Berry tour. A friend of mine, a musician, told me about it. I got in touch and go the job. MG: How was the engagement with Albert Collins arranged? LM: Again, a friend of mine, also a musician, gave me a ring and told me that Collins was looking for a pianist for his two shows in London. I played there and got the job. MG: What about the Screamin' Lord Sutch? LM: We recorded an album, which was arranged by Rod De'Ath. Sutch's old hits were being re-recorded for an LP which was planned to be put on the German market. Keith Grant (bass) and Terry Gibson (guitar), two old friends of mine, who played with the Dowliner Sect, were also there. MG: What about the recordings of Gerry McAvoy’s solo album? LM: All the recordings were organized by Gerry. They were recorded before and after I left the band. Most of the recordings were recorded live in the Bridge House, one of the best clubs at the end of the 70's. At that time, there were many friends helping each other at concerts or studio sessions. LM: Tommy is a good friends of Paul Rogers ( ex-Free/ Bad Company/ The Firm). Since Paul and I know each other, he asked me and Rod De'Ath whether we would like to record an LP with Tommy. I do not think Tommy has ever played live. MG: How big, do you think, is the chance for a successful future for the Mick Clarke Band? Can you imagine a break-through of the band, similar to Vaughan's, Thorogood's? LM: Mick and I have been very close friends for over 20 years. His development as a guitarist is most remarkable. In my opinion, he certainly ranks among the top musicians. His voice and stage performance have improved greatly. So why not? MG: Is there the possibility of you becoming a permanent member of the band? LM: I would like to spend as much time as possible with the band. But because of my engagements, it not possible just now. I would like to be more involved. Anyway, I play on the first two of the four albums by Clarke. If I had more time or if there were not so many engagements, I would not have to think twice. MG: Which musicians did you do jam sessions with? Are there any hard rock bands among them? LM: It is hard to remember everybody, but there were certainly a few sessions worth being remembered. For example, there was a very fine one in 1975 at the Montreux Jazz Festival in Switzerland. Rory was there, Rod De'Ath and Gerry MacAvoy, Louisiana Red came, Harvey Brooks on bass, a West Coast veteran, who played on Mike Bloomfield's LP's. Besides, there was the whole brass band of Etta James. During an American tour there was a big encore with the Rory band and the Doobie Brothers. During a break in 1973 in Chicago, I played two days in Otis Rush's band. At that time I saw lots of interesting people for the first time live, for example, Junior Wells, Phillip Guy, Mighty Joe Young......In 1968, we (killing Floor) played with Freddie King. There were hardly any hard rock musicians, no famous ones for that matter. MG: Music wise, which moments do you consider the best? LM: The first time I was live on stage with Freddie King and Rory, the gigs with Otis Rush, the shows with Albert Collins and Chuck Berry, then of course when I met Muddy Waters, the concert with the Mick Clarke Band in Chur was brilliant. MG: Which was the best period? LM: When I was with Rory, no doubt. Everybody in the band was improving incredibly fast because we played most nights and everywhere. In any case, I learnt most at that time. MG: What did you enjoy more, to play live or in the studio? Which live performances did you enjoy most? LM: I liked every band a lot. We always had a lot of fun on stage. There were so many fine gigs with Rory. And even though they were writing so many negative things about Chuck berry nowadays, I must say that at least every third gig with him was fantastic. As far as the studio is concerned, I usually played with Rory. But other studio recordings , too, were nice. Apart from Rory, it is probably Mick Clarke I like working with most. MG: Which LP, in your opinion, is the best from those you played on? LM: Calling Card, because of the way I play and also the whole feeling of the album. I would have liked to have made an LP with Chuck Berry because the group he had at that time was really great. I also like the two albums with Mick Clarke, particularly, Rock Me. It would be nice to get a gold disc for that one. MG: Now, here is a quite different subject: What do you or other Rory band members think of fanclubs? LM: No idea. Anyway, I think a good fanclub is important for 90% of the musicians. I do not think that it is smiled at. Probably there are many people who realize only now that there is a Rory fanclub and that the fanzines is really interesting. In any case, I like reading it. MG: Apart from music, do you have any other hobbies? MG: Here are a few questions which I am really interested in. Is it something special to play at the Montreux Jazz Festival? LM: It is one of the most important jazz festivals in Europe. Beautiful setting and scenery. MG: I would like to know what do you think of my favorite musicians. Here they are: Canned Heat, Stan Webb's Chicken Shack, Taj Mahal, John Hammond and Tony McPhee's Groundhogs. LM: During all the years that I have been in the music scene, I have met musicians, either personally or at least I saw them live. Of course I have also collected their LP's. My favorite if those you mentioned are John Hammond and Canned Heat. 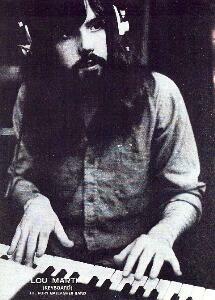 During one of Rory's concerts in 1974 or 1975 in Canada, there was a session with John Hammond. Later we were joined by Freddie King. I also saw Taj Mahal live. However, I prefer his early works when he played more blues than he does now, Nowadays, Stan Webb's Chicken Shack, as well as Tony McPhee's Groundhogs play mainly the clubs in London. In general, their shows are still very good. MG: Here comes my last question, which might also be quite interesting for our Deuce readers. What would you do if Rory asked you whether you would like to join the band again? LM: If her really offered me this job, I would probably say yes. We have the same roots and he has certainly influenced me over the years.